NXT AWD 4-Wheeled Robot: Step-by-step directions for building a four-wheeled robot. Using the EV3 Display Block: This short PDF shows a few important considerations about what coordinate arrays are used with the different features of the display block. We find this to be one of the stickier points when using the block, but learnable. Building a Simple NXT Treaded Robot: Step-by-step directions for building a Simple NXT Treaded Robot. Updated 7/2012 for use with the newer LEGO tread sets. Building a Simple NXT Wheelbot: Step-by-step directions for building a Simple NXT Wheelbot. This is the NXT robot used in our track meet competitions for the speed build event. 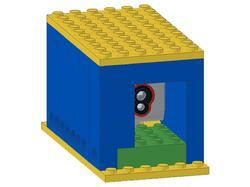 LEGO TRACK3R Robot Building Guide: ​Here is a simplified version of the LEGO instructions. Just enough to build the basic robot. Building the Domabot: Step-by-step directions from Damien Kee's website. Click the image to the left to open the directions. Using the NXT Touch Sensor: This video will show you some of the basics for using the NXT touch sensor as well as a simple program with the LEGO MindStorms software. Advanced Programming Guide for NXT MindStorms: Look at the Display Block, Variables, Data Wires, Switches and Loops. Robot Locomotion Basics: This video will talk about the 3 basic wheel and tread designs. 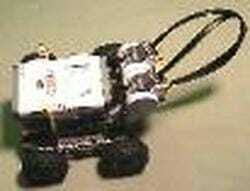 The 2 wheel robot with a pivot wheel; the all wheel drive; and the treaded robot. LEGO Technic Tora no Maki Building Guide (English) A free download ($10 suggested donation) this is a 215 page book available as PDF for helping you build with LEGO Technic Pieces. follow a line using the NXT and a single light sensor. EV3 Doma-like Robot: Step-by-step directions for building a 2-wheel EV3 robot with a rear pivot ball. Courtesy of Billy Wall. Light Sensor Trigger assembly: Step-by-step directions for building this simple sensor housing unit to be used with a light source (we use laser line levels, but bright flashlights work too. NXT Robot Guide Sheets (21 pages): These are 11 different handouts for use in the classroom. All (but one) are two sides, designed to give a lesson with background information on the topic. From building a robot, to using gears, to turning, to light and touch sensors. Similar to our previous version for the RCX, but designed for use with the NXT. Calculating Robot Travel Distances (worksheet): This worksheet allows you to scientifically calculate how far your robot will travel for each rotation of its motors. 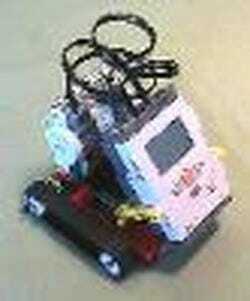 EV3 Simple Wheelbot: Step-by-step directions for building a Simple EV3 LEGO Robot. This is the the EV3 robot used in our track meet competitions for the speed build event.